Hey Hey, Check the Overlay! Hello! This #WebTortoise post was written 2012-SEP-20 at 03:43 PM ET (about #WebTortoise). #- Use programs like Excel or Tableau to get additional formatting value from your third-party-provided chart data. #- Continually measure website Performance to identify Pattern Changes, be them by minute of hour, by hour of day, by day of week or by some other dimension. Point-in-time measurements have value, where continually measuring will tell more of the story. #- Use overlay charts (a.k.a. “Compare to Previous” charts) to complement time-based line charts. Use overlay charts to also identify especially subtle Pattern Changes. Time-based line charts are probably the most popular chart type (at least in Web Tortoise world). In them, some period of time will be along the X axis where we read it from the left to the right, matching to a corresponding Y axis value as we go. The chart could be showing anything (e.g. from website response time by the hour to number of website hits by the day) but they are all read the same way. When reading a time-based line chart, will generally look at the value for a given period and compare to the previous value. Was it the same as the previous value? Was it more or less than the previous value? If the value was different, by how much? Is there a blip, or is there a sustained Pattern Change? Note this chart is showing a Performance Index and the values of the Y axis are materially irrelevant. What’s to be focused on is the general shape(s) of the daily patterns. First, download the chart data and load into Excel; then apply custom formatting. Might say the below chart is prettier with additional formatting, but still can’t quite identify the day or hour of the Pattern Change. Second, take the above time-based line chart and turn it into an Overlay chart. 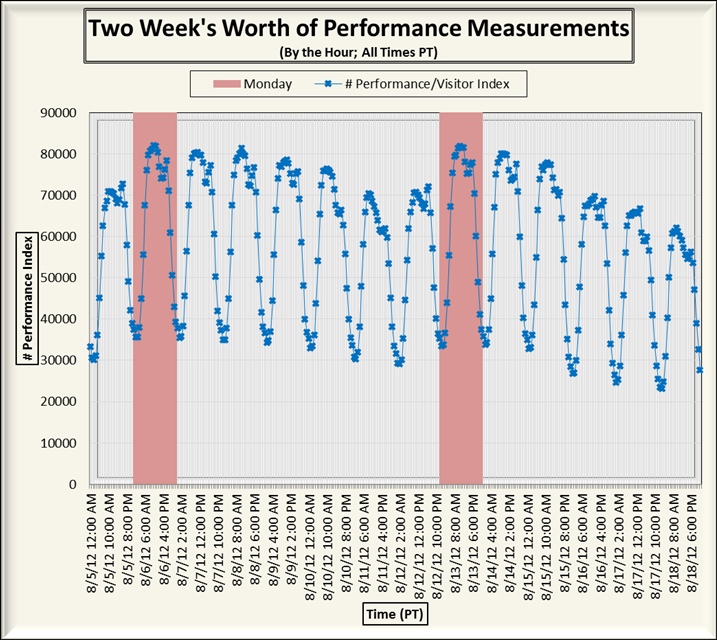 Since this chart is for 2-weeks, by the hour, there are 336 data points (24 hours in a day * 14 days = 336). To create the overlay, take the latter 168 data points and plot along the Primary (bottom) left-to-right X axis; take the earlier 168 data points and plot along the Secondary (top) left-to-right X axis. Note in the below Overlay chart, using both Primary and Secondary axis titles takes up a lot of real estate. May remove the Secondary axis title if comfortable doing so. Note I also chose to override Excel’s auto-sizing of the chart to ensure its length and width were using the Golden Ratio. Here again, this takes up a lot of real estate, but adjust accordingly. 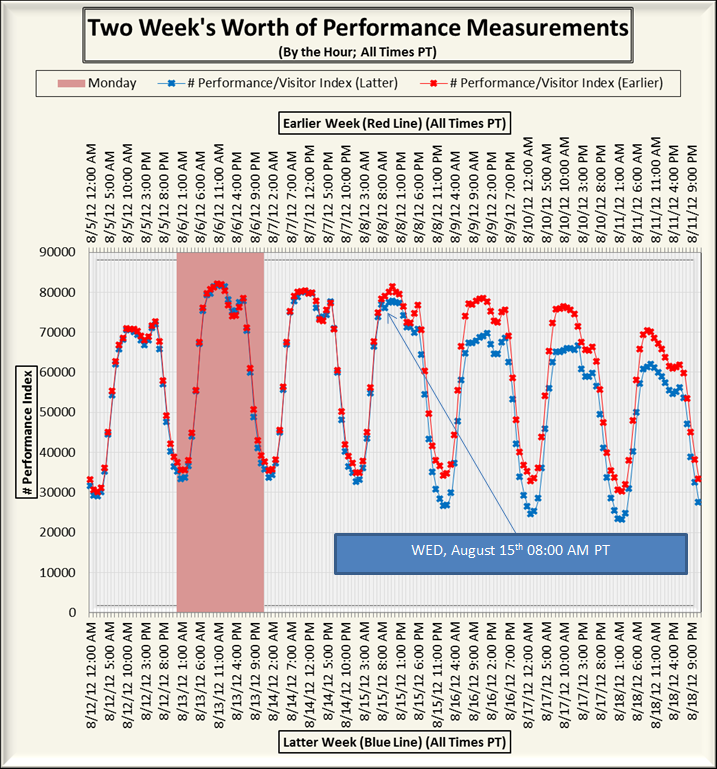 Because we used some semi-advanced Excel formatting features, because we continually measured Performance and because we Checked the Overlay!, we are able to report the sustained Pattern Change started on Wednesday, August 15th in the 08:00 AM PT hour. At this point, consider engaging Release, Change or some other Management Function to figure out why.